Are the MAPS available to identify legal and illegal land of Bahria Town Karachi? Allah ka shukar hai main ne investment nahi ki.. Lekin kia abb investment karni banti hai legal land pe? yeah..I can easily see them taking the line "logon kay khoon paseenay ki kamai lagi hai is mein"
Hamesha apnay walid sahib ki baat maan'nay se barkat hoti hai.. Unhon ne mana kia tha Bahria main lene se buhat pehlay.. Main yehi sochta raha ke kyun mana kar rahay hain.. itni achi opportunity hai.. lekin sahi baat hai unn ki baat maannay main hi bhalai hai..
Lekin abhi mujhay koi mashwara nahi de rahay.. iss liey poocha forum pe.. kehtay hain agar plot legal land pe ho tou lelo..
Yeh hota hai verdict...us dramaybaz dallaal saqib nisar ki terha nahi Jo sirf baat kerta that aur boli lagata that. Sahafi Malik Riaz ke khilaaf bol ke apni rozi roti per kyun laat maarein ge? Kuch hosh kero yaar aap log bhi. If he walks free, he will loot even more and many others will follow his footsteps. 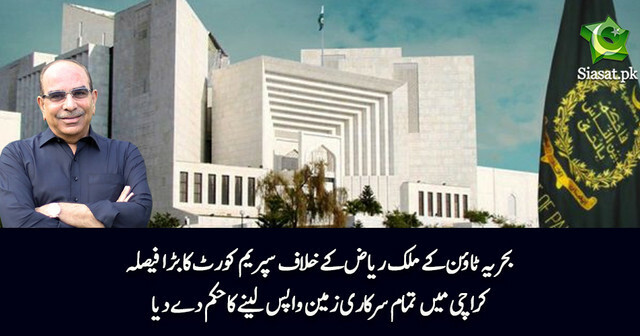 I think after the SC verdict, Malik Riaz will agree to make a cash settlement at what ever price SC wants. He can't afford not to make a settlement. This is the implementation bench. SC already gave verdict in this case. There is no going back to Supreme court. Settlement has been rejected, Order has been issued to demolish and take land back. No more settlement left in this case. Only determination of the land boundary needs to be decided now, which will be done by SUPARCO. I still think a settlement would have been better. Malik gets the land, SC gets the full price and all the investors money is safe. NOw it will be a mess.